Seven people were arrested following an incident where security forces opened fire into a crowd of community members commemorating 1 May in Aimas district, Sorong. On 30 April 2013, a group of community members gathered at the house of Isak Kalaibin to commemorate the 50th anniversary of the administrative transfer of Papua to Indonesia, with the intention of holding prayer sessions. Reports from local human rights sources state that at around 20:00 Papuan time, security forces comprised of police and military officials in four vehicles fired warning shots, agitating the crowd who then proceeded towards the vehicles. Security forces responded by firing into the crowd for 20 minutes, causing the death of two activists, Apner Malagawak and Thomas Blesia. A third activist, Salomina Klaibin, the sister of Isak Klaibin, later died in hospital under suspicious circumstances. Isak Kalaibin, Klemens Kodimko, Obeth Kamesrar, Antonius Saruf, Obaja Kamesrar, Yordan Magablo and Hengky Mangamis were charged with conspiracy to commit treason under Articles 106 and 110 of the Indonesian Criminal Code and possession of weapons under Emergency Law 12/1951. 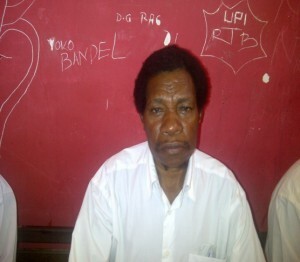 The seven activists received legal accompaniment from the Institute of Research, Analysis and Development for Legal Aid (Lembaga Penelitian, Pengkajian dan Pengembangan Bantuan Hukum, LP3BH) and members of the Civil Society Coalition for the Upholding of Law and Human Rights in Papua. According to LP3BH, the seven activists faced restricted access to their lawyers while in detention in Sorong police station. Police reportedly cited Article 115 of the Criminal Procedure Code, which states that in cases of suspected treason, lawyers may observe the interrogation but may not actually hear what is being said. This practice is in contravention of the UN Basic Principles on the Role of Lawyers. On 26 August 2013, prosecutors presented three witnesses, two of whom were reportedly not present at the time of the incident on 30 April. Defence lawyers objected to the Prosecutor’s submission of these two witnesses – the head of Aimas District government and the head of the government National Unity office (Kantor Kesatuan Bangsa, Kesbang) in Manokwari. Defence lawyers also questioned the issue of a flag-raising pole, mentioned in the investigation report (berita acara pemeriksaan, BAP) and prosecution letter (surat dakwaan), used as evidence against the seven activists. They argued that that no such object was present during the incident. The seven men were forced to testify against each other and defence lawyers expressed disappointment with judges when they moved to accuse Isak Klaibin when he was called to the stand as a witness on behalf of Obaja Kamesrar. In November 2013, human rights lawyers reported that Obeth Kamesrar appeared to suffer from trauma while in detention and had reportedly been silent since his arrest. In September and October 2013, lawyers also reported the deteriorating physical condition of Antonius Saruf and Klemens Kodimko. Saruf suffered from an existing heart condition which was exacerbated by stress caused by his detention and trial while Kodimko suffered acute gastric pains. On 3 December 2013, Klemens Kodimko, Obaja Kamesrar, Obeth Kamesrar, Antonius Saruf, Yordan Magablo and Hengky Mangamis were sentenced to 1.5 years’ imprisonment for conspiracy to commit treason under Articles 106 and 110. Isak Kalaibin who faced an additional charge of possession of weapons under Emergency Law 12/1951 received a prison sentence of 3.5 years. The National Commission on Human Rights (Komisi Nasional Hak Asasi Manusia, Komnas HAM) visited Aimas as part of its investigations into the shootings on 30 April. A statement by LP3BH asserts that the investigations were inconclusive. At the time of writing, the findings of the Komnas HAM investigations have not yet been published. On 1 November 2014, Yordan Magablo, Hengky Mangamis, Obaja Kamesrar, Antonius Saruf, Obeth Kamesrar and Klemens Kodimko were released following the end of their prison sentences. UN Basic Principles on the Role of Lawyers.